Enough of definition and introduction..
Let us now move to the first composite processing method called SPRAY UP, an open mold process. In this method, you will need a chopper gun that will chop away the glass roving. In this method, only glass roving only that can be use. While the resin mainly is polyester. If the finish product needs to have core the core have to incorporate separately. The process in this method involve chopping the fiber in a hand-held gun and fed into a spray of catalysed resin directed at the mould. And then the deposited materials are left to cure under standard atmospheric conditions. Typical Applications are Simple enclosures, lightly loaded structural panels, e.g. caravan bodies, truck fairings, bathtubs, shower trays, some small dinghies, etc. 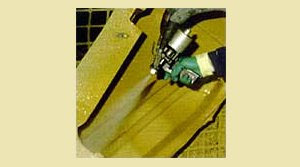 The main advantage spray up method is it involve a very low cost tooling. It is a low cost way of quickly depositing fibre and resin and have been used for many years. Beside of the advantages, the disadvantages of this method should also take into consideration. By using this method, laminates tend to be very resin-rich. This will make the finish product will be a lot more heavier. Because of the chopping process, the fiber is only short fibers. Thus some limitation of properties will apply. The properties will not the same as using long fibers. This consideration should be taking into account depending on your product application.